Gotta hand it to Google: It knows its product, the oft-mocked/loved/critiqued Google Glass, looks sort of nerdy — which is why the company's now come out with more stylish frames and prescription lenses for its product, designed to make the product's wearer look like (less of) a dork. The slate-colored titanium frames, designed by Google's in-house team, come in four choices: Bold, Curve, Thin, and Split. They go on sale today to the Glass Explorers team, and cost an additional $225 (that's in addition to the $1,500 the technology already costs). Three styles of sunglasses are also available for $150. It might, however, be worth it: Besides looking a little more normal (although that awkward screen bit still hangs around the side), the new frames also have the capacity to carry prescription lenses for an extra cost — something that a lot of early Glass users requested because the only thing dorkier than the Glass is having to wear two pairs of glasses. "We're going to reach some day, hopefully it will be soon, where people will wonder 'why would I want traditional glasses? 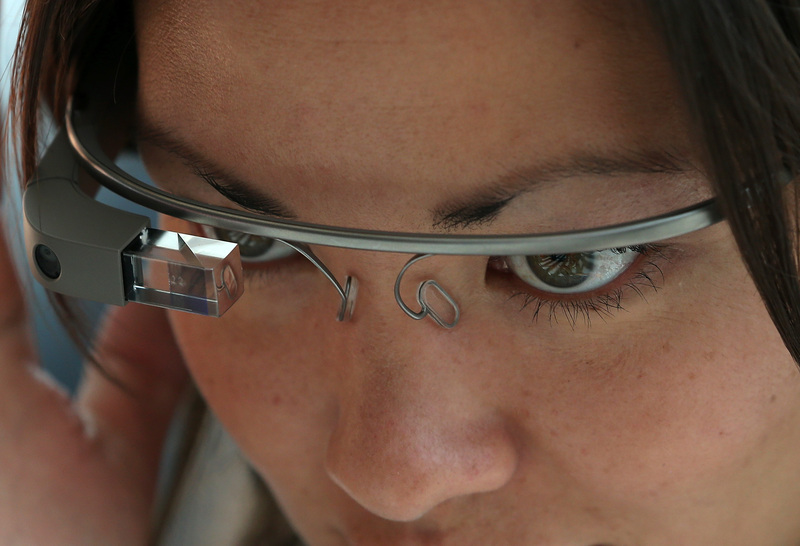 They don't do X, Y or Z,' " said Google Glass Product Director Steve Lee. Although, "We're making it more subtle," said Lee. "That will improve over time." Google's gone so far as to help VSP (the giant insurance provider) train optometrists to outfit the Glasses with the lenses, even though the product isn't rumored to be commercially available until the end of this year. Although the technology itself is designed to be modular (mounted with a screw to the frame), the glasses look pretty silly on their own sans Glass, because the right side of the frames is designed to be shorter than the left to accommodate the technology. And that presents some problems on its own: "... making these new frames a single unit means that you're going to need to keep your original glasses around for when Glass's battery inevitably dies on you," writes the Verge. "Wearing Glass is one thing; wearing it when it's completely inert is something else." Fashion faux-pas alert: Designer frames or not, don't be a Glasshole.